ANSD : Policy Paper: Five years after the “Arab Spring”: What happened? 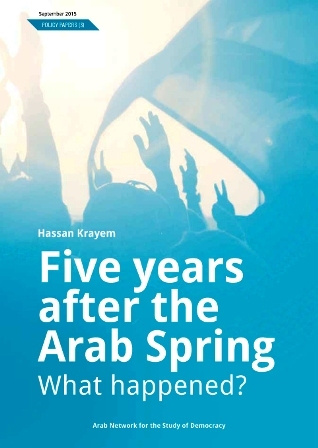 Policy Paper: Five years after the “Arab Spring”: What happened? A wave of optimism was unleashed in late 2010 that the end was neigh for authoritarian regimes in the region. This wave came in the wake of the broad-based movements in the Arab world supporting revolutions for freedom and deliverance from authoritarianism, which began in Tunisia and Egypt and then came to Libya, Yemen, Syria, and the remaining Arab countries to varying degrees. Now, a wave of severe pessimism reigns over the region, following recent developments in most of these countries, with perhaps the sole exception of Tunisia. Accordingly, this paper seeks to review in brief what occurred in these countries, with a focus on what has been accomplished as well as the barriers, obstacles, and challenges these countries have faced and continue to face during the process of democratic transition. This paper will also seek to explain recent developments, especially in terms of their negative effects on this process of moving toward democracy. But first, it must be emphasized that what has happened so far is just the beginning of a process of liberation from authoritarianism. This does not mean that in all cases the transition process will proceed mechanistically or automatically toward building democracy. It likewise means that some of these countries may succeed while others fail or lag behind. However, a qualitative transformation has occurred with the revolutions for deliverance from authoritarianism, from which there is no return—no matter how long the transition periods last, and regardless of whether the process stalls, stumbles, or is even reversed by a temporary victory of counter-revolutionary forces. This conclusion comes not out of optimism of the will, or out of deterministic logic, but from the premise that the causes and the reasons for the outbreak of the revolution not only still exist, but also have both grown worse and increased in number. Furthermore, it follows that if these authoritarian regimes failed to convince this current generation, which rebelled against them, then the regimes will be even less capable of taming the next generation, which will have the inclination and the desire for even broader and more comprehensive change. Regardless of the many challenges and setbacks facing citizens demanding freedom and democracy, it must be noted that these uprisings led to the overthrow of the four heads of state in Tunisia, Egypt, Libya, and Yemen, as well as to constitutional changes in these four countries plus Morocco and Jordan. This paper will review the outcomes in five Arab countries: a case of relative success in Tunisia, and four cases of failure in Syria, Libya, Yemen, and to a lesser extent Egypt—noting both the shared and the unique causes for the deterioration and decline of the democratization process in the latter cases.